I purchased these boots in October from Ranger Joe's dot com. The retail cost for these is anywhere between $90-$100 depending on where exactly you buy from. I needed a major change in boots as my old pair were my initial issue pair and were very worn out; plus they didn't have much to offer for comfort in the first place. It took about a week to get my boots via UPS and Ranger Joes does not offer free shipping so I paid about $105 after everything was said and done. I needed a pair that was comfortable, a brand that was reputable, and a pair that would last me years to come. I chose these due to their lower pricing in comparison to other boots. I was swinging for the fences when it came to how they felt on the inside. These boots come in a few different varieties although I stuck with a more traditional style. You have the option of getting a side zipper however I chose strictly laces. The soles are slip free and oil resistant, the entire boot itself is stitched suede with molded plastic lace inserts, and breathable material helps air flow through the boot. Despite the amount of padding inside the boot these are fairly lightweight and far from the heaviest boot I've worn. For the price I feel that this boot is a good package for someone like myself. The stitching is doubled in most spots although not all. The soles are very rugged and have already taken quite the beating from months upon months of airsoft and daily wear through all weather climates. The soft and generous lining along the ankle portion of the boot really helps cradle my feet and ankles and makes these very comfortable to wear for extended hours. I've used these boots in airsoft and during my daily work routine throughout the past 12 months and they have performed admirably if not even better than when I first got them. Before I broke these boots in I found a few rub spots that brought blisters and broken skin for the first few wears. After about 5 days of airsofting the rubbing became less aggressive and the boots weren't as bad to maneuver with. I started wearing these to work as winter set in (I work outdoors) and that's when the performance of these boots really started to show. After giving them a good month of everyday solid wear these started to feel just like a pair of tennis shoes. Once the suede got wet a few times and had a chance to form to my feet these were some of the most comfortable boots I've ever worn. 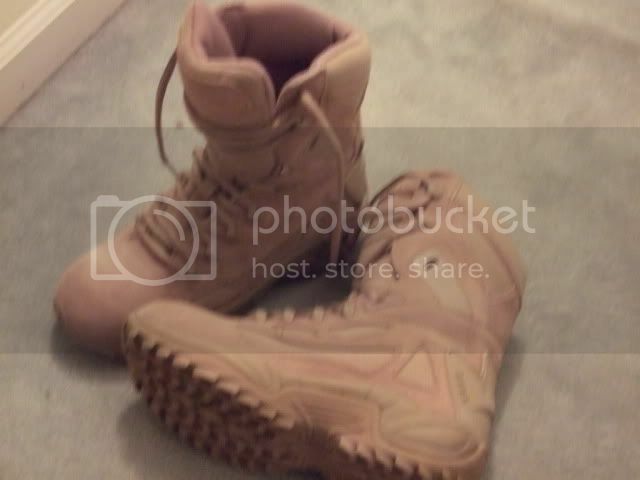 For the price I think I got a great pair of combat boots for multiple uses. I can wear these out with a pair of jeans and they look good, I can wear them at work and the keep my feet dry and my knees pain free (for the most part), and they work wonderfully for airsoft and rugged trail type terrain. These are great boots for both summer and winter use however with the amount of padding that is in these boots you might be in for some sweaty feet on a hot summer day as these boots don't breathe as well as hot weather boots. With that said I have no problem giving these boots a 10/10. Great value for the money and many years of use can come from these diverse boots. I continue to wear these boots in cold weather and for airsoft and they feel even better than they used to. Not only does it feel as if they molded to my feet but there is literally no rubbing anymore and the entire boot fits like a glove and feels like tennis shoes. These babies are lightweight compared to many other boots I've acquired since the initial review; these are hands down my Go-to pair. There is not one stitch out of place, the treads are holding up great, and the comfort is phenomenal. If you can find these puppies in stock and you can afford them; I HIGHLY recommend these. I know I will be getting a second pair if I ever come across them again. Simply fantastic.